Ladybug, ladybird, lady beetle: It doesn't matter how you refer to this cute little beetle, it's still a member of the family Coccinellidae, in the order Coleoptera. Despite the "lady" in the name, there are male and female ladybugs. The guys likely don't care, and if they do, they can use their binomial names. Not only aren't ladybugs all ladies, but they aren't really bugs. Ladybugs are beetles, whereas bugs are of a different order, Hemiptera. They may look the same, but there are minor differences. Winged insects have two pair of wings; the beetle's second pair should be hard and thickened and the outer half of the bug's second pair should be translucent. Bugs and beetles also have different mouthparts and larval development. Most people don't think about whether the beetle in the garden is a male or female, especially when the differences aren't obvious. Generally, in the ladybug world, females are bigger than the males -- helpful if you're looking at several ladybugs. But to the untrained, naked eye, it's hard to differentiate between the two. Entomologists, with the help of a microscope, can identify parts on their undersides, such as the presence of more fine hairs on the last segment of the male's sternite. Otherwise, you might catch a pair in the act of mating, which is a male ladybug on top of the female ladybug. 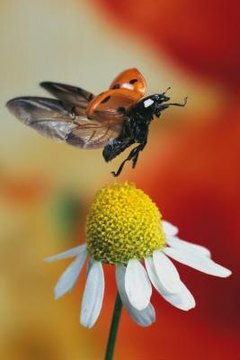 If you see one ladybug alone, it's safer just to say "good day," instead of "good day sir!" The ladybug didn't get her name because of her feminine looks or lady-like ways. As Animal Planet notes, the legend of ladybugs goes back to the Middle Ages, when European farmers were suffering as insects ravaged their crops. The farmers prayed for relief, which eventually came in the form of these colorful beetles, who ate the crop-destroying bugs. In gratitude, the farmers referred to the beetles as "Our Lady's beetles," in reference to the Virgin Mary. Ladybugs have more in common across gender than differences. All of them go through the same metamorphosis, transforming from an egg, to larva, to pupa to an adult beetle. The larvae have six legs and molt several times as they grow. All ladybugs have elytra, which are top wings. You can tell what kind of ladybug you're looking at by examining the elytra and counting the number of spots and their colors. For example, Coccinella novemnotata, or the nine-spotted ladybug is red with four spots on each wing and one in the center. Different species of ladybugs eat different things, ranging from aphids, plants, plant pollens and other insects. Texas A&M AgriLife Extension: Insects in the City: What are Beetles? Why Are Ladybugs Considered Good Luck? How Does a Ladybug Adapt to Its Environment to Live Long?